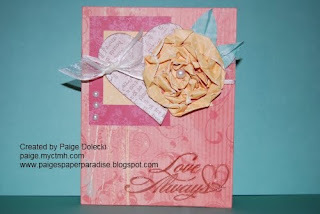 Today's card uses the same paper set and basic elements (a heart and a big flower) as yesterday's card. I wanted to show how easy it is to take a couple of the same elements but make different cards. The sentiment has been stamped in Chocolate and then I went over the letters with Liquid Glass - the needle point tip allows you to follow writing or make very small details - love it! I again stamped the heart with our Noted Backgrounds set but this time in Chocolate.